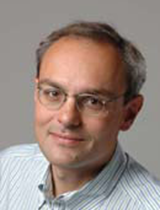 Bio: Panos Papadopoulos is a Professor of Mechanical Engineering at the University of California, Berkeley, and director of the Computational Solid Mechanics Laboratory. After obtaining his Diploma in Civil Engineering from the Aristotle University, Greece, he moved to California to pursue his graduate studies. He obtained his M. Sc. and Ph.D. in Civil Engineering from UC Berkeley. His research involves experimental, analytical and computational studies of several mechanics systems. Prof. Papadopoulus develops and applied the finite element method to problems in biomechanics, dynamics of pseudo-rigid bodies, mechanics of continues media, plasticity, materials science and contact mechanics. This talk describes a method for extending the classical Irving-Kirkwood procedure used in statistical mechanics for extracting local fluxes to the problem of continuum-on-continuum multiscale modeling. Expressions for stress and heat flux derived here are contrasted to those obtained using the standard Hill-Mandel approach. The polar nature of the macroscopic solid and the role of multiscale invariance are also addressed in the context of this method. Applications are explored within the finite element-based homogenization of solids.